Coming so soon, Autumn is! Oh, I feel it in the crisp, cool of the mornings, and in the evening when I snuggle under the sheets and use a blanket for the first time in months. There's a shift in the energy; with or with out visible signs of Autumn, I can feel that it's on the way. To be fair, Summer still has a week to blow it out. I'm loving the produce, and the blue skies. But what I really love is riding the cusp of a season shift. The space in between. So exciting to anticipate and prepare for change. Autumn has always been my favorite season. I savor the colors, the smells, the chill. I love it for it's beauty as much as it's signal to turn inwards, to let go, and be still. It is something to honor - the vibrancy of nature as it dies. We are celebrating the shift over here. I celebrate each time I pull on a sweater. I celebrate with a hot beverage each morning. We celebrate with dinner on the front porch. I celebrate by (slowly) putting up herbal medicines for winter. Here's some photos of other ways we are taking in the change of seasons. pumpkin, stout and belgian brews! 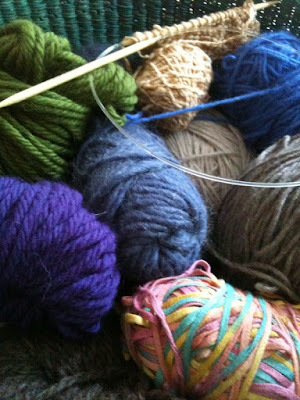 many, many knitting projects to start ... too many? perhaps. -and if you haven't seen The Business of Being Born you really, really ought to. you can get it from Netflix and i doubt anyone would regret seeing it. Ricki Lake is even making a sequel, there is that much to say and show about Birth. Your advocacy is much appreciated! It's how I began, with my first pregnancy and birth with a home birth midwife, so I am thankful to pass the stick to you, sister! Keep it ever growing and passing ~ it's the best addiction ever! yes christie, it is the best addiction ever! thanks for being such an overflowing source of inspiration! i got the birth bug, bad! When 3 months old you are, not as cute you will be. Hmmmpphh!